A dictionary is basically a list words in a specific language, with definitions, etymologies, pronunciations, and other information; or a list of words in one language with their equivalents in another, also known as a lexicon. Generally, the words are given in alphabetical order. In many languages, words can appear in many different forms, but only the undeclined or unconjugated form appears as the headword in most dictionaries. Historical information about the words' use, including quotations, may also be included. The purposes of a dictionary are, thus, many; with different types of dictionaries focusing on different purposes. Generally, though, a dictionary is a valuable source of information about a language, allowing members of the public to improve their knowledge of the history and use of the words they encounter in all aspects of their lives. This improves their ability to communicate both in spoken and written language, with members of their contemporary society and those of different cultures, as well as better understanding the written works of others they do not meet face to face. 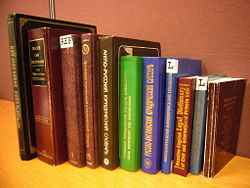 Dictionaries are most commonly found in the form of a book, but some newer dictionaries, such as the New Oxford American Dictionary are dictionary software running on PDAs or computers. There are also many online dictionaries accessible via the Internet. Thus, dictionaries advance along with advances in technology, maintaining appropriate ease of use and, thus, continue to have a valuable role even as human society advances. As far as archaeologists have been able to determine, Ancient Mesopotamians were the first to create dictionaries, carving cuneiform words and their Akkadian equivalents on clay tablets. Other ancient dictionaries include the Shuowen Jiezi from China, and a Greek lexicon (specifically a list of words used by Homer, and their meanings) written by Apollonius the Sophist. A multi-volume Latin dictionary in the University Library of Graz. The earliest European dictionaries were bilingual dictionaries. These were glossaries of French, Italian, or Latin words, along with definitions of the foreign words in English. An early non-alphabetical list of 8000 English words was the Elementarie, created by Richard Mulcaster in 1592. The first purely English alphabetical dictionary was A Table Alphabeticall, written by English schoolteacher Robert Cawdrey in 1604. It was eight years ahead of the first Italian dictionary and thirty-five years ahead of the French. Conversely, it is eight hundred years after the first Arabic, and almost one-thousand years after the first Sanskrit dictionary in India. The only surviving copy of Cawdrey's work is found at the Bodleian Library in Oxford. Yet, this early effort, as well as the many imitators which followed it, was seen as unreliable and nowhere near definitive. It was not until Samuel Johnson's A Dictionary of the English Language (1755) that a truly noteworthy, reliable English dictionary was deemed to have been produced, and the fact that today many people still mistakenly believe Johnson to have written the first English dictionary is a testament to this legacy. By this stage, dictionaries had evolved to contain textual references for most words, and were arranged alphabetically, rather than by topic (a previously popular form of arrangement, which meant all animals would be grouped together, for example). Johnson's masterwork could be judged as the first to bring all these elements together, creating the first "modern" dictionary. Johnson's dictionary remained the English-language standard for over 150 years, until the Oxford University Press began writing and releasing the Oxford English Dictionary in short fascicles from 1884 onwards. It took nearly 50 years to finally complete the huge work, and they finally released the complete OED in 12 volumes in 1928. It remains the most comprehensive and trusted English language dictionary to this day, with revisions and updates added by a dedicated team every three months. Meanwhile, in 1806, Noah Webster published A Compendious Dictionary of the English Language. The following year, at the age of 43, he began writing an expanded and comprehensive dictionary, An American Dictionary of the English Language, which would take 27 years to complete. Webster hoped to standardize American speech, since Americans in different parts of the country spelled, pronounced, and used words differently. His book contained 70,000 words, of which 12,000 had never appeared in any earlier published dictionary. As a spelling reformer, Webster believed that English spelling rules were unnecessarily complex, so his dictionary introduced American English spellings like "color" instead of "colour," "wagon" instead of "waggon," "center" instead of "centre," and "honor" instead of "honour." He also added American words that were not in British dictionaries like "skunk" and "squash." Though it now has an honored place in the history of American English, Webster's first dictionary, published in 1828, sold only 2,500 copies. Webster died in 1843, a few days after he had completed revising an appendix to the second edition. George and Charles Merriam secured publishing and revision rights to the 1840 edition of the dictionary, publishing a modest revision in 1847. In 1864, Merriam published a much expanded edition, largely overhauling Noah Webster's work, yet retaining Webster's title, An American Dictionary. This began a series of revisions known as Unabridged, which became increasingly more "Merriam" than "Webster." 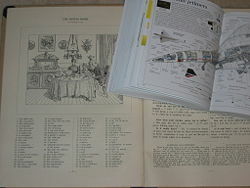 Picture dictionaries explain concepts from soup-tureen in the 1904 Engelska bild-glosor med textöfningar … to supersonic transport in the 1998 Visual Encyclopedia. Dictionaries exist primarily as reference material on a particular language or languages. In modern times dictionaries are often used to the reference the correct spelling, pronunciation, etymology, meaning and/or usage of a particular word. Bi-lingual dictionaries are often consulted to reference one word's equivalent in another language (a Spanish-English dictionary will often give the Spanish translation of English words, and vice versa, but not necessarily give the word's meaning). More academic uses of dictionaries include records of languages, either to trace the roots and evolution of a particular language, or to document those languages that are dying or are extinct. Picture dictionaries contain word entries that, for all or most such entries, are accompanied by photos or drawings illustrating what the words mean. They are usually used with young children, but are also useful when one knows (or has an idea of) what something looks like, but lacks the correct term for it. A dictionary open at the word "Internet," viewed through a lens revealing typical information including pronunciation, grammatical forms, as well as meaning. Dictionaries can vary widely in coverage, size, and scope. A maximizing dictionary lists as many words as possible from a particular speech community (such as the Oxford English Dictionary), whereas a minimizing dictionary exclusively attempts to cover only a limited selection of words from a speech community (such as a dictionary of Basic English words). The word order of dictionaries depend upon the language it is based upon. Most languages with alphabetic and syllabic writing systems, such as English, French, and Italian, list words in lexicographic order, usually alphabetical or some analogous phonetic system. In dictionaries of some other languages, most notable Hebrew, Sanskrit, and Arabic, words are grouped together according to their root word, with the roots being arranged alphabetically. If English dictionaries were arranged like this, the words "import," "export," "support," "report," "porter," "important," and "transportation" would theoretically be listed under the Latin portare, "to carry." This method has the advantage that all words of a common origin are listed together, but the disadvantage is that one must know the roots of a word in order to find it. While most Japanese and Korean dictionaries are arranged according to their phonetic writing (kana syllabic script for the Japanese, and hangul alphabet for the Korean), the main body of modern Chinese dictionaries is ordered according to the latin alphabet with the pinyin spelling; but most Chinese dictionaries have an appendix ordering entries accordance to the Chinese logographic writing system, in order to allow readers to find words written in logograms whose pronunciation is not known. Chinese characters may be sorted according to one of many schemes based on the component parts of the characters (radicals, number of strokes, overall shape). Dictionaries for languages for which the pronunciation of words is not apparent from their spelling, such as the English language, usually provide the pronunciation, often using the International Phonetic Alphabet. For example, the definition for the word "dictionary" might be followed by the (American English) phonemic spelling: /ˈdɪkʃəˌnɛri/. English dictionaries, however, often use other systems, such as the English Phonemic Representation system, in which the pronunciation of "dictionary" is given as [dĭk'shə-něr'ē]. Yet others use an ad hoc notation; for example, "dictionary" may become [DIK-shuh-ner-ee]. Dictionaries function as a record and reference for a particular language, yet there are times when a dictionary can actually affect the lexicon of the language it is trying to document. One of the clearest examples is the debate between how words are recorded in the dictionary. Dictionary makers apply two basic philosophies to the defining of words: prescriptive or descriptive. 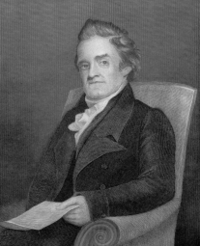 Noah Webster, intent on forging a distinct identity for the American language, altered spellings and accentuated differences in meaning and pronunciation of some words. This is why American English now uses the spelling color while the rest of the English-speaking world prefers colour. Similarly, British English subsequently underwent a few spelling changes that did not affect American English. Large twentieth century dictionaries, such as the Oxford English Dictionary (OED) and Webster's Third are descriptive, and attempt to describe the actual use of words. While descriptivists argue that prescriptivism is an unnatural attempt to dictate usage or curtail change, prescriptivists argue that to indiscriminately document "improper" or "inferior" usages sanctions them by default and causes language to "deteriorate." Although the debate can become very heated, only a small number of controversial words are actually affected. However, the softening of usage notations from the previous edition for two words, ain't and regardless, out of over 450,000 in Webster's Third in 1961, was enough to provoke outrage among many with prescriptivist leanings, who branded the dictionary as "permissive." The prescriptive/descriptive issue has been given so much consideration in modern times that most dictionaries of English apply the descriptive method to definitions, while additionally informing readers of attitudes which may influence their choices on words often considered vulgar, offensive, erroneous, or easily confused. Merriam-Webster is subtle, only adding italicized notations such as, sometimes offensive or nonstand (nonstandard) American Heritage goes further, discussing issues separately in numerous "usage notes." Encarta Webster's Dictionary of the English Language provides similar notes, but is more prescriptive, offering warnings and admonitions against the use of certain words considered by many to be offensive or illiterate, such as, "an offensive term for…" or "a taboo term meaning…." There are several different types of dictionaries that focus on specific groups of words or areas of specialized interest. For example, a medical dictionary is a lexicon for words used in medicine, while a law dictionary is a dictionary that is designed and compiled to give information about terms used in the field of law. A multi-field dictionary broadly covers several semantic fields (such as a dictionary of the social sciences), a single-field dictionary narrowly covers one particular subject field (such as law), and a sub-field dictionary covers a singular field (such as constitutional law). In terms of the above coverage distinction between "minimizing dictionaries" and "maximizing dictionaries," multi-field dictionaries tend to minimize coverage across lexical fields (for instance, Oxford Dictionary of World Religions) whereas single-field and sub-field dictionaries tend to maximize coverage within a limited subject field (such as The Oxford Dictionary of English Etymology). There are also Language for Specific Purposes (LSP) dictionaries that describe a variety of one or more languages used by experts within a particular subject field. Data sets and databases collected and utilized for statistical analyses are typically accompanied by, or able to be used to generate, a list of all variable names used within the data set, as well as matters such as their meaning, values, level of measurement, length, decimal allowances, and type (numeric, string, and so forth). Another dictionary variant is the glossary, an alphabetical list of specific terms and words. 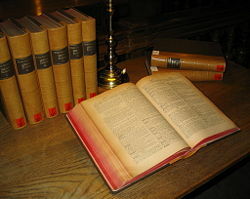 Often glossaries are found as an appendix to books on a specific subject, such as a science text book, although books that have been published for wide circulation, (usually non-fiction) may have a glossary for readers who are not necessarily familiar with words or terms used in the writing. Sometimes a glossary exists as its own publishing, intended for use in a specialized field, such as medicine and law dictionaries, which used words and terms that have been specially added to the lexicon for use in those areas of interest. Usually such terms are not used often in the general lexicon outside of those specialized areas and therefore contain words and phrases not found in other dictionaries. Since the internet revolution of the mid 1990s, schools and companies have been creating dictionary databases that can be accessed via the internet. At first, most of these internet dictionaries were merely electronic copies of already existing dictionaries; later however, completely new dictionaries began to appear on the internet with no hard-copy correlate. 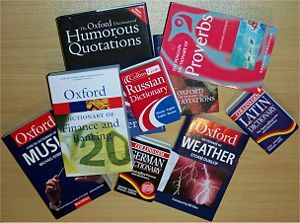 Some of these dictionaries are free to any user, while others require a fee or request users to become members and pay a monthly fee for usage. Most on-line dictionaries are now interactive, with such features as search engines, helpful notes, and programs that help users to cite the dictionary as a reference. Some dictionaries will help translate words and phrases from one language to another, while specialized on-line dictionaries have links to related websites. The most widely-used law dictionary for the law of the United States was founded by Henry Campbell Black. The first edition was published in 1891, and the second edition in 1910, long before the first edition of the Oxford English Dictionary was completed in 1928. Black's dictionary has been cited as legal authority in many Supreme Court cases. The latest editions, including abridged and pocket versions, are useful starting points for the layman or student when faced with an unfamiliar legal word. It is the reference of choice for definitions in legal briefs and court opinions. Sometimes referred to simply as Brewer's, this is a reference work containing definitions and explanations of many famous phrases, allusions and figures, whether historical or mythical. Originally published in 1870, by the Reverend E. Cobham Brewer, it was aimed at the growing number of people who did not have a university education, but wanted to understand the origins of phrases and historical or literary allusions. The "phrase" part of the title refers mainly to the explanation of various idioms and proverbs, while the "fable" part might more accurately be labeled "folklore" and ranges from classical mythology to relatively recent literature. Brewer also added notes on important historical figures and events, and other things which he thought would be of interest, such as Roman numerals. This French-language reference book first appeared in 1905 and was later published in a 100th anniversary edition in 2005. The book has two main sections: A dictionary featuring common words and an encyclopedia of proper nouns (compare encyclopedic dictionary). 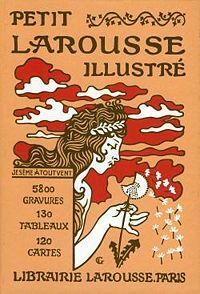 The motto of Pierre Larousse, Je sème à tout vent ("I sow to all winds"), is perpetuated in Larousse's publications and inspired the cover art of Le Petit Larousse which typically features a female figure blowing dandelion seeds. One of the lesser known creations of the Brothers Grimm outside of Germany was their German dictionary, the Deutsches Wörterbuch, which they started in 1838, and was finally finished in 1961. This was the first major step in creating a standardized "modern" German language since Martin Luther's translation of the Bible to German. It represented a very extensive (33 volumes, weighing 84 kg) standard reference for German etymology, remaining so to this day. Completed in 1873 by the famous French scholar Emile Littre and often called simply the Littré, this dictionary contains an authoritative interpretation of the use of each word, based on the various meanings it had held in the past, beginning with the earliest meaning. It also contains numerous quotations from works of literature, illustrating the use of words and the development of the French language. Considered the most thorough dictionary of the English language, the O.E.D. contains roughly 301,000 entries, each of which lists every known meaning of the word, and a very extensive etymology. A dictionary of Canadian English, first published by Oxford University Press Canada in 1998, it quickly became the standard dictionary reference for Canadian English. The second edition contains 300,000 entries, including about 2,200 true Canadianisms. It also provides information on Canadian pronunciation and on Canadian spelling, which has features of both British and American spellings. ↑ 1.0 1.1 Microsoft Encarta Online Encyclopedia, Dictionary. Retrieved June 5, 2008. ↑ The British Library, 1582—Mulcaster's Elementarie (2008). Retrieved June 5, 2008. ↑ 3.0 3.1 Jack Lynch, How Johnson's Dictionary Became the First Dictionary. Retrieved June 21, 2008. ↑ Britannica Concise Encyclopedia, Oxford English Dictionary, Answers.com. Retrieved June 7, 2008. ↑ The Columbia Electronic Encyclopedia, Dictionary. Retrieved June 7, 2008. ↑ Yuen Ren Chao and Lien-sheng Yang (eds. ), Concise Dictionary of Spoken Chinese (Harvard University Press, 1947, ISBN 0674123506). ↑ David Micklethwait, Noah Webster and the American Dictionary (Jefferson, NC: McFarland, 2000, ISBN 9780786406401). ↑ Kenneth G. Wilson, The Columbia Guide to Standard American English (Columbia University Press, 1993, ISBN 0231069898). Bowker, John. The Oxford Dictionary of World Religions. Oxford University Press, 2007. ISBN 978-0198662426. Duva, Grete, Henning Bergenholtz, and Sven Tarp (eds.). Manual of Specialized Lexicography. John Benjamins Publishing Co, 1995. ISBN 978-1556196935. Editors of The American Heritage Dictionaries. The American Heritage Dictionary of the English Language, 4th edition. Houghton Mifflin, 2006. ISBN 978-0618701728. Erdmann, Peter, and See-Young Cho. A Brief History of English Lexicography. Retrieved June 22, 2008. Garner, Bryan A. (ed.). Black's Law Dictionary, Eighth Edition. Thomson West, 2004. ISBN 978-0314151995. Landau, Sidney I. Dictionaries, The Art and Craft of Lexicography. Scribner Book Company, 1984. ISBN 0684180960. Merriam-Webster. Webster's Third New International Dictionary, Unabridged. Merriam-Webster, 2000. ISBN 978-0877793021. Morton, Herbert C. The Story of Webster's Third: Philip Gove's Controversial Dictionary and its Critics. Cambridge University Press, 1995. ISBN 978-0521558693. Nielsen, Sandro. The Bilingual LSP Dictionary. Narr Verlag, 1994. ISBN 978-3823345336. Micklethwait, David. Noah Webster and the American Dictionary. Jefferson, NC: McFarland, 2000. ISBN 9780786406401. Onions, C. T. (ed.). The Oxford Dictionary of English Etymology. Oxford University Press, 1966. ISBN 978-0198611127. Simpson, John and Edmund Weiner (eds.). The Oxford English Dictionary (20 Volume Set). Oxford University Press, 1989. ISBN 978-0198611868. Soukhanov, Anne (ed.). Encarta Webster's Dictionary of the English Language: Second Edition. Bloomsbury, 2004. ISBN 978-1582345109. Winchester, Simon. The Professor and the Madman, A Tale of Murder, Insanity, and the Making of the Oxford English Dictionary. HarperCollins, 1998. ISBN 0060175966. This page was last modified on 24 October 2017, at 15:05.